Canon EOS 700D Camera Prices in 2013 released Canon DSLR type camera to replace its predecessor the Canon EOS 650D with a slight difference that stood out and adding creative features on the Canon EOS 700D. For the kitchen runway Canos EOS 700D uses the DIGIC 5 processor. This is the type of processor Canon's great to process the results of our caputre. In addition to the DIGIC 5 processor also helps us speed up autofocus on the object to be captured. With the advantages on offer Canon EOS 700D apply processing effects " Creative Filters " on point shoot , making it easier to pre - visualize how the end result will look help to inspire arrests images that only work well in the treatment effect . STM Lens Support for Quiet AF in Movies, 18.0MP APS - C CMOS Sensor, DIGIC 5 Image Processor, 3.0 " Vari - Angle Touch Screen LCD, ISO 100-12800 , Expandable to 25600, Full HD 1080 Video with Continuous AF, 5.0 fps Continuous Shooting, 9 - Point All Cross - Type AF System, Multi Shot Noise Reduction, Compatible with Canon EF and EF - S Lenses. Canon EOS 700D - 18 - 55mm IS Kit STM - USD 869, Canon EOS 700D - Kit 18 - 135mm IS STM USD 1.119. 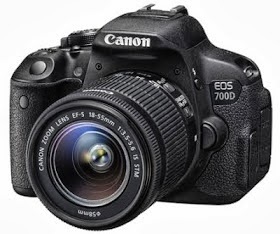 Thus information Price Camera Canon EOS 700D/Rebel T5i and Full Specifications 2013 may be useful for those who want to hunt the latest camera in 2013. Canon EOS 700D has an ISO range of 100-12800 which can be maximized to 25600 range which is very possible with a shooting speed of 5 frames per second ( fps ). With the use of a 9 point Auto Focus that can track an object to be easy. 0 Komentar untuk " Canon EOS 700D Rebel T5i "